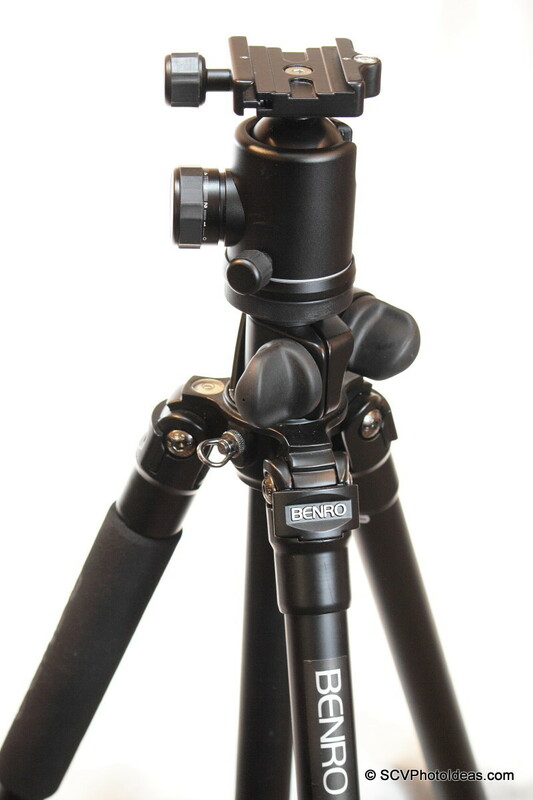 Speaking of a ball head like the Benro B-2, the manufacturer gives us a maximum load in the specification. What is this load meant for, and how was it measured? Since there is not any clarification about that, to my humble knowledge up to now, but a vague idea that a ball head can withstand a load of equipment up to the max load in specification. To be on the safe side, a common rule of thumb is to buy a ball head that can withstand 2-3 times the weight of the equipment that will be used. In order to clarify all the above I decided to conduct a test on a more meaningful basis. Conducting a test without following some already proved path is quite a task. Therefore the first step is to lay down some rules as to what is to be tested and how. 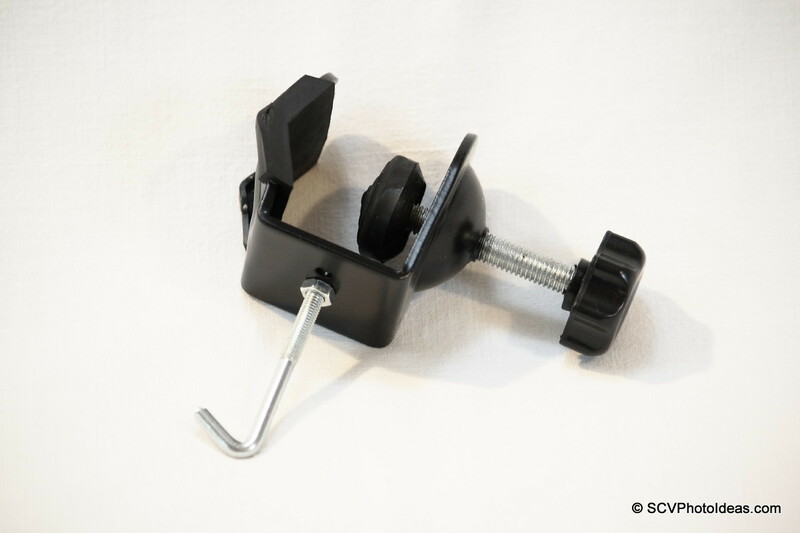 Putting it simply, a ball head has a sphere that has a tendency to pivot on its center when we put a load on the attached plate or clamp on top. The ball locking mechanism exercises a frictional force on the surface of the ball in order to counterbalance the load and keep the ball inert. However, this load does neither exercise a force on one point, nor is static because a vibration or a rip of air can alter many things. Therefore, what we want to test measure is the strength of the locking mechanism, to keep the ball inert while a force like gravity is applied on top when we load with a weigh. Once again, this force is not vertical to the vertical axis of the ball. For example a camera with lens has a volume and its mass exceeds the range of the diameter of the ball itself. The force that is needed to move the ball from inert position is called Torque (or Minute). In our case r equals to the distance between the pivoting point of a ball had and the center of gravity of the camera + lens + flash + etc we intend to attach on top of the ball head. This center of gravity does not lay flat on top of the ball head, it is usually quite higher and further away. How are we going to measure? In order to simulate as closely as possible the behaviour of the ball head, we need to attach a weightless* bar, rod, tube etc a little higher than the ball head clamp (approximately the center of a lens when mounted on a camera) and hang a known mass on it at various points, until we shall determine the point where with the slightest vibration the ball leaves its inert position and starts to move. 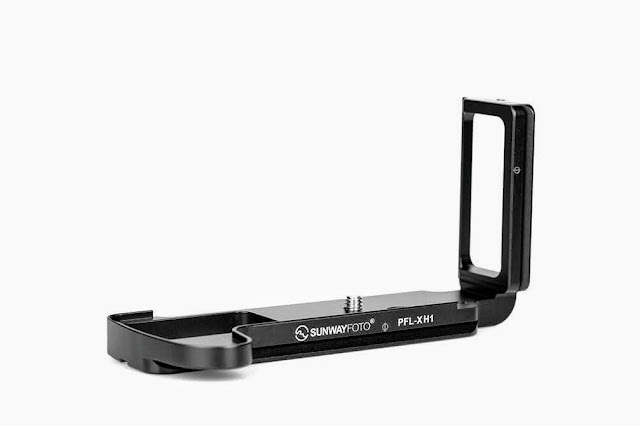 For a secure attachment of a long tube I chose a Manfrotto Super Clamp 35 which is strong enough to withstand the stress and its internal cavity is 4cm (1.57") above the base, quite convenient as it approximates very closely the middle of a lens attached on a camera body. For a long tube I chose an extendable back drop bar from my lighting staff. 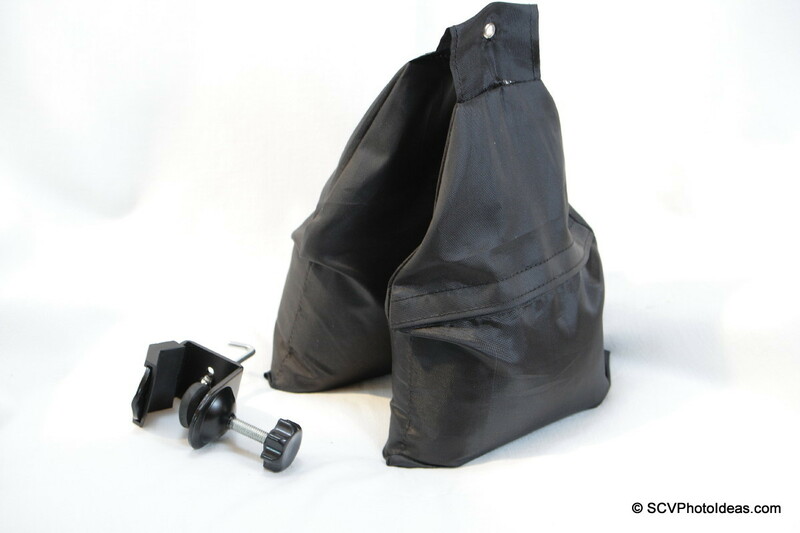 For a known mass it was an easy choice, of a sand bag with its clamp that is used as a counter balance on one of my lighting boom arms. 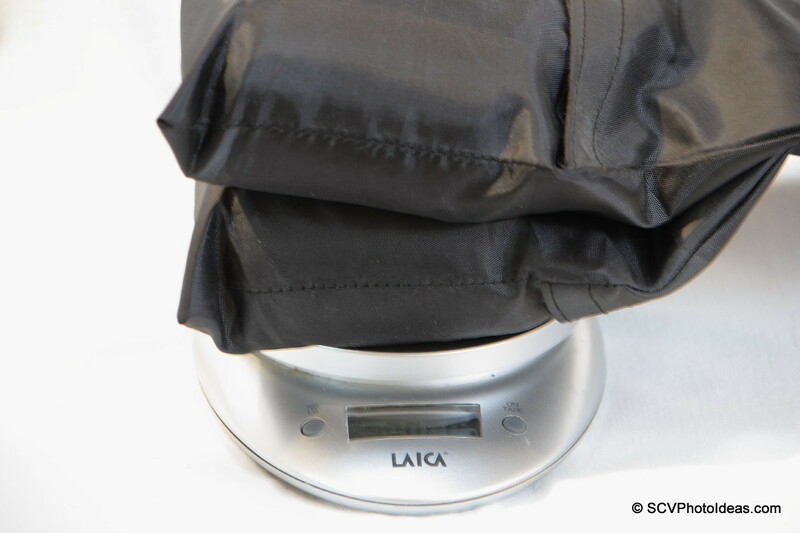 *Weightless means that it will not interfere to our measurement with its mass (weight). 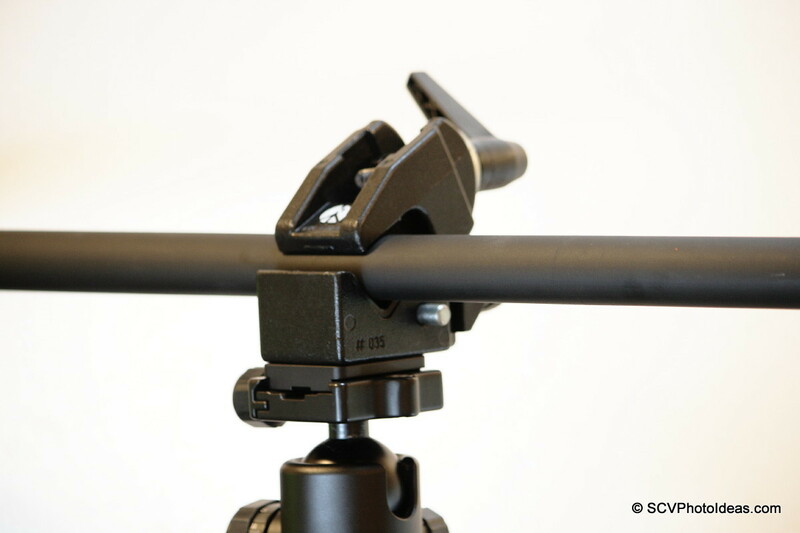 As there is not such thing as a weightless bar the way to achieve this is by using quite a long bar that will balance itself on each side of the ball head clamp. See relevant photo further bellow. 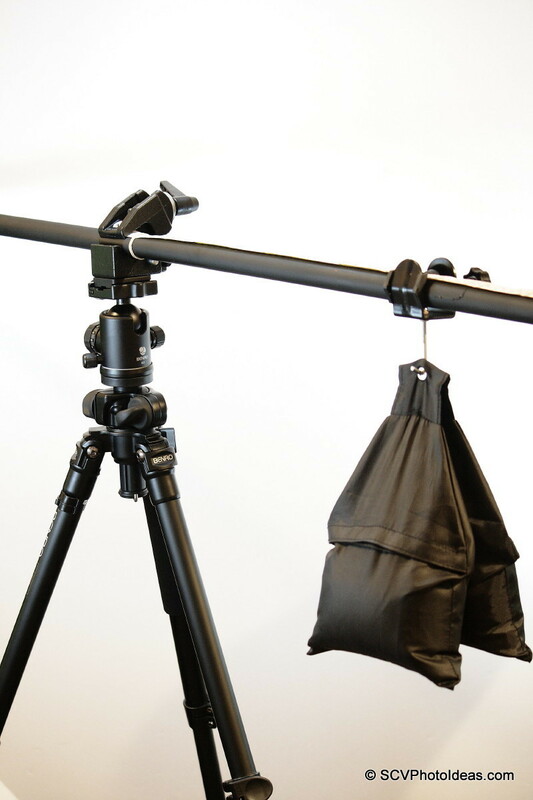 The Benro B-2 Ball Head to be tested. 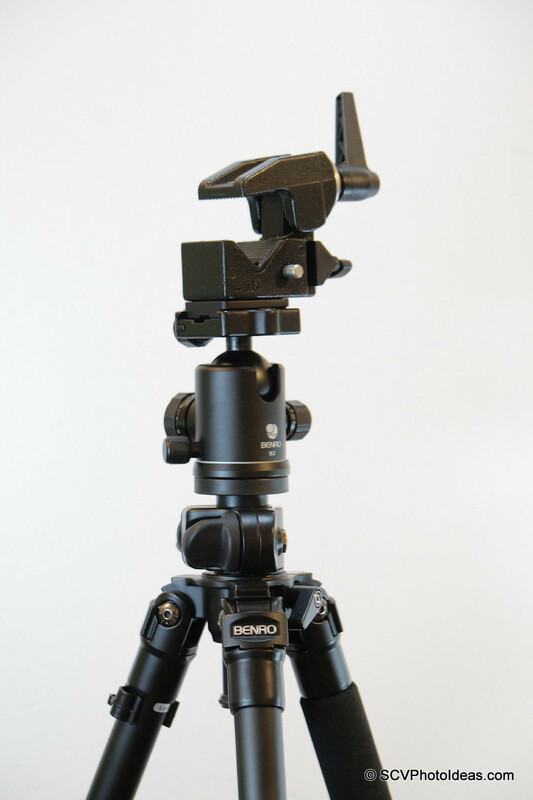 Of a Benro A-298 EX Versatile Tripod. The plate is screwed in the bottom 1/4"-20 tapped hole and tightened with pliers. For hanging the weight I picked a clamp which I use for the counter-weigh on one of my lighting boom arms. 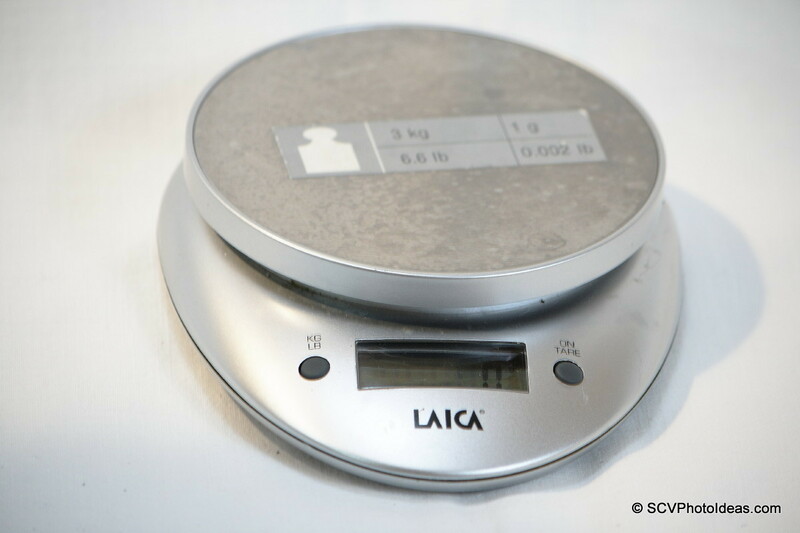 An electronic scale is needed to measure exactly the balance weight. 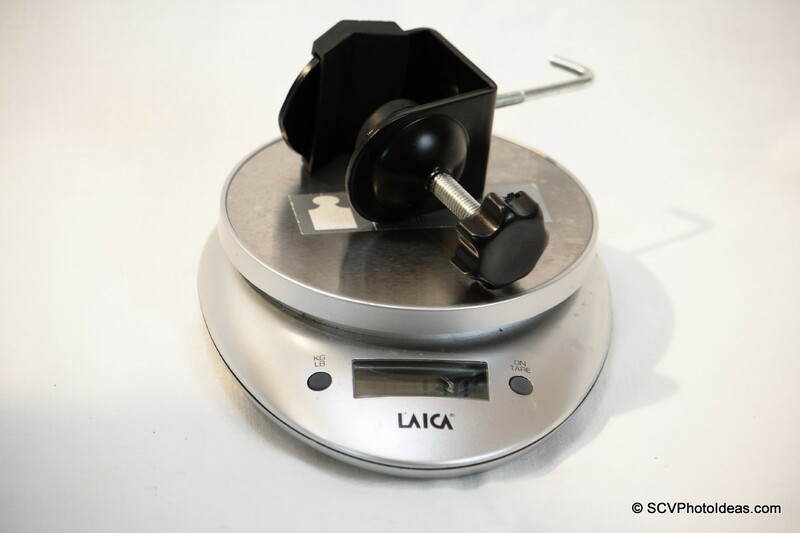 The clamp weighs 171gr (0.377 lbs). For hanging the offset weigh, I picked one expandable tube, which I use for hanging backdrops. Due to its construction (tube in a tube) is sturdy enough and will not bend under load. Before proceeding, we need to tighten both the friction and the locking knobs as far as they go. Attaching the Super Clamp exactly in the middle on the Ball head, so as its weight is balanced. 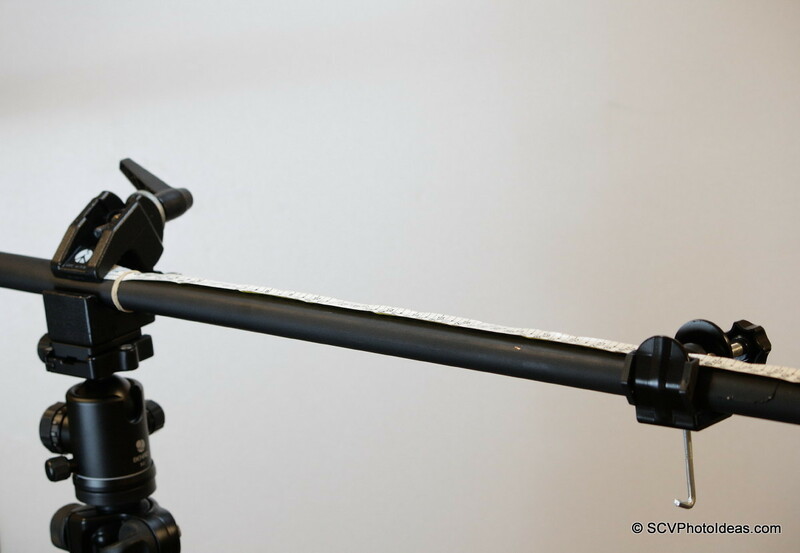 The back-drop hanging tube should be positioned in the middle and balanced on the clamp so its weight will not interfere in our measurements. The tube is then tightened as far as possible. 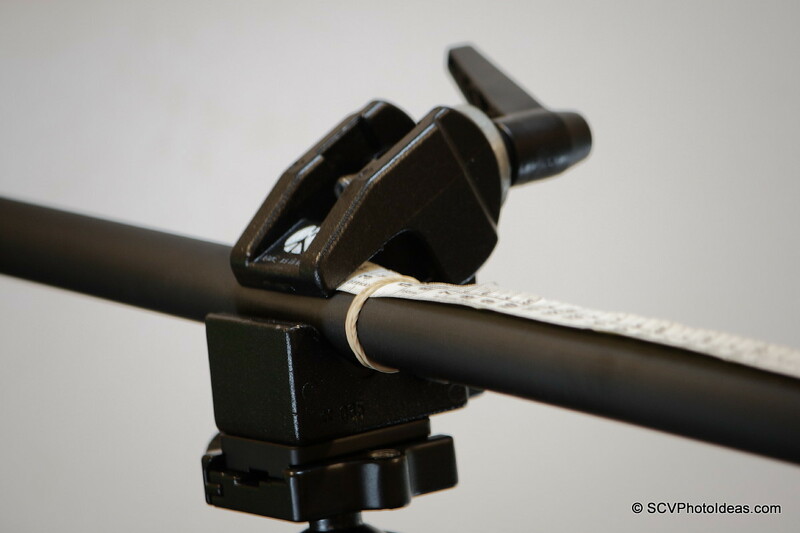 The hanger clamp is positioned and a measuring tape is attached on the upper surface of the back drop tube. Point zero (0) is placed in the middle of the clamp above the axis of the center of the ball head. The sand sack is up and measuring starts. My concept for measuring the torque that this ball head could withstand, was to hang the counter-weight as far as possible on one side of the bar and start to move inwards in 0.5 cm increments until the ball would stay inert. At the point that the ball stayed inert, I exercised a vibration on the tripod. If the ball did not remain still then the counter-weight was moved another 0.5cm inwards until it did. That was a method to simulate any external cause that would make the ball loose its locking ability. Nevertheless, it is not a very refined test up to laboratory standards, but as long as the same method is used and the measurements can be repeated and remain at the same values time after time, a very reasonable conclusion may be reached about the capabilities of the specific product. First of all I was curious to see how far this ball head could manage to go. With both Friction & Lock knobs tightened as far as possible, exceeding their scales by one or two points starting from zero again, what would be 10 for the Friction knob (max is 8) and 14 for the Lock knob (max is 12) which is not exactly convenient for normal use, the reading was quite astonishing for the ball head category. The maximum distance that the ball stays inert (locked) in this setup with a weight of 3.170 kg is 47.5cm (18.70") which gives us 150.575 KgF*cm Torque. Theoretically, this means a little more than 30Kg max load measured directly on the ball head. Not bad at all for a medium class ball head !!! Then I wanted to have specific readings for the marks on the scales of the Friction and Lock knobs respectively. Which would show how the ball head would behave within these limits and if the scales had any meaning. With the Friction knob turned to its maximum reading of 8, I measured the torque for each number on the Lock knob scale ( 0 - 12 ) starting with 12. At mark 03 and bellow on the Lock knob, the Friction setting does not permit a measurable difference because it is more dominant and the reading remains the same. 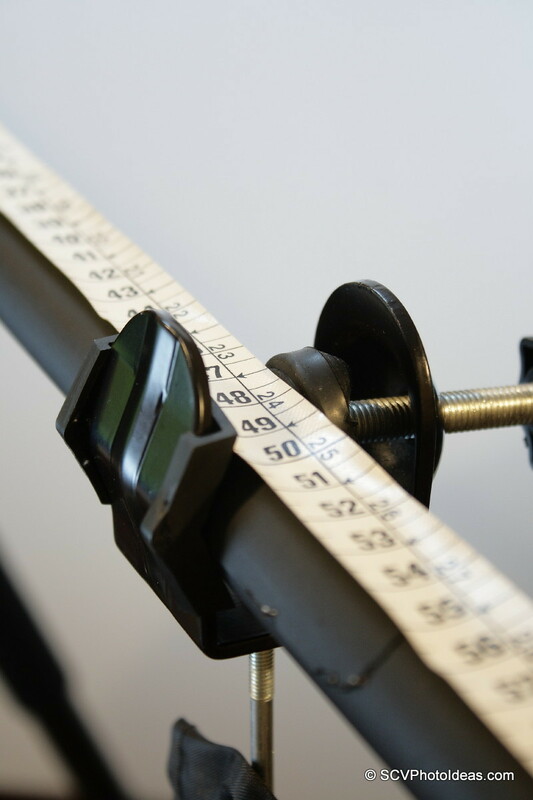 The above results show a steady and gradual decline of the torque measurements without any abrupt changes from reading to reading on the scale. That means that the locking mechanism is well designed and that the marks on the scale actually represent something. However, through this process I made some observations that are not so favourable. 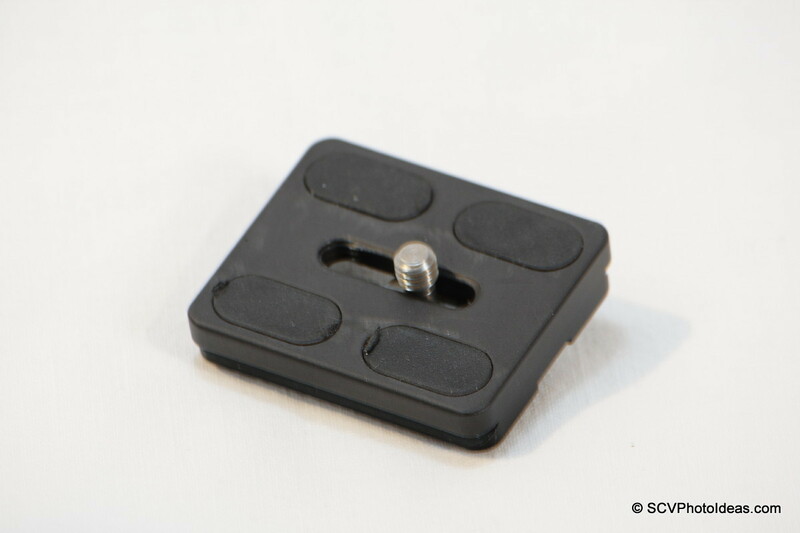 When over tightening the lock mechanism, after its release it takes a few movements back and forth for the friction parts to go back in place and unlock the ball. That in my opinion has to do with the design of the locking mechanism and especially with the Teflon inserts that may be a little bit deformed under excess pressure and need some time to get back in shape. In order to be exact, some measurements had to be performed one or two more times, sometimes after releasing the lock mechanism and then putting it to the next lower mark, especially in the high end of the scale. Although I gave this ball head a hard time, in no way I had a dead lock on the ball, as it happens with some low quality and design ball heads. Measuring at 45 degrees angle. A usual problem with ball heads, is their behaviour when they reach an angle of 45 degrees and greater. At this angle ball heads are usually loosing their grip on the ball and an adjustment must be made to the friction or the locking knob in order to keep the ball inert. After the previews discussion about torque above, it is now easy to understand why. 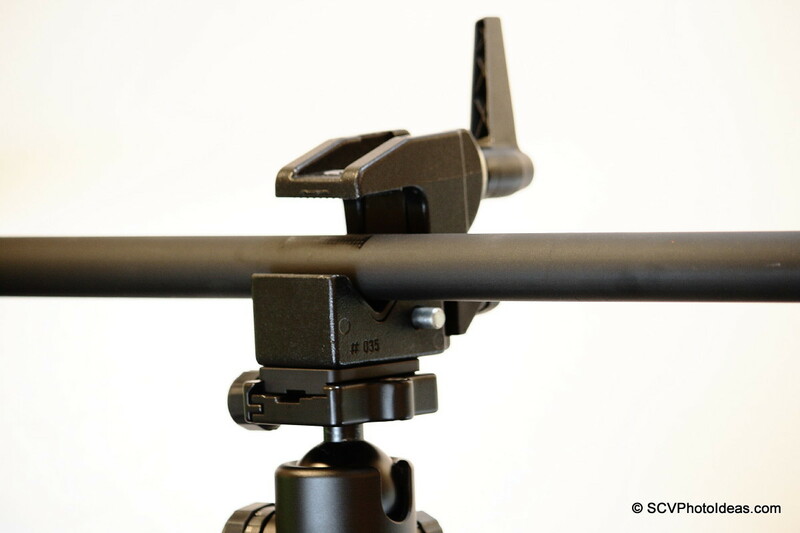 When the ball head top plate is tilted from the vertical position the distance between the load hanging point and the pivoting point of the ball is increased, thus the torque is increased. The longer the stem between the ball and its top plate, the greater the increase of torque thus the greater the tendency to tilt. Some manufacturers have adopted an elliptical shape on their balls so as to compensate mechanically for the increase in torque. On en elliptical ball more friction will be exercised when it tilts. 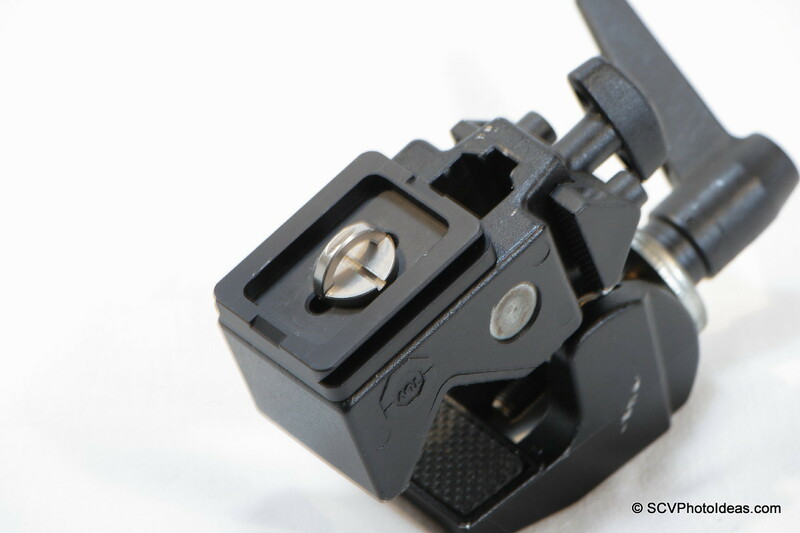 Other manufacturers try also to keep the stem between the ball and its top plate as short as possible, so as to keep the load displacement within the limits of the ball diameter. A few like the original Arca-Swiss® do both. Large elliptical ball with short stem. But now let's see how Benro B-2 performs on this test. Measuring in 45 degree angle. This measurement was conducted with an idle starting point at 45 degrees instead of a vertical position. I placed the top plate at an angle of approximately 45 degrees first and then hanged the counter weight. With the Friction knob turned to its maximum reading of 8, I measured the torque for a few numbered marks on the Lock knob scale ( 9 - 12 ) starting with 12, to determine whether there was a difference. By comparing the two measurements for the same marks at vertical and at 45 degrees, one can easily realize that there is a steady difference. At 45 degrees the measurement for mark 12 approximates to the measurement for mark 10 at vertical and so on. Therefore, the Benro B-2's ball is not elliptical and there is a need for a 2 index marks compensation when tilting a heavy lens for example. 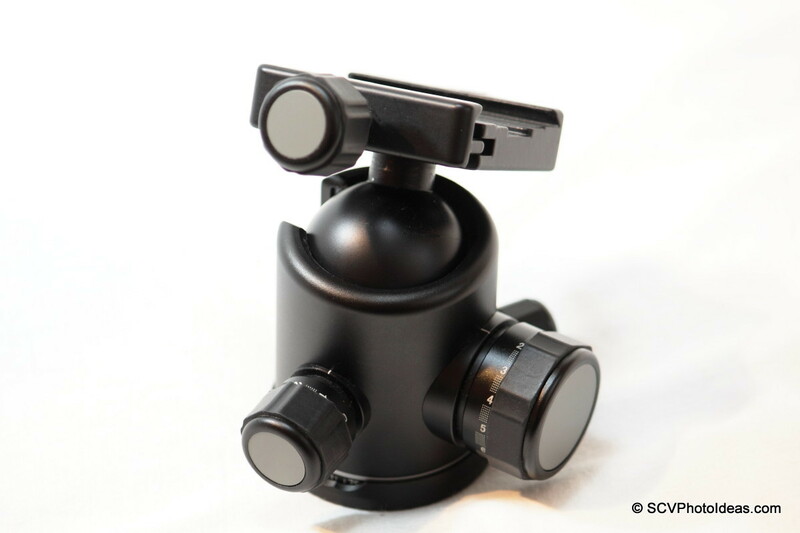 All above testing would mean little to a prospective user of this ball head, unless it is combined with the product's behaviour with popular equipment. My choice of two popular Canon zoom lenses, was meant to specify the limits of the ball head combined with something known. (My apologies to the Nikon-ian friends as I did not have any Nikon equipment available). 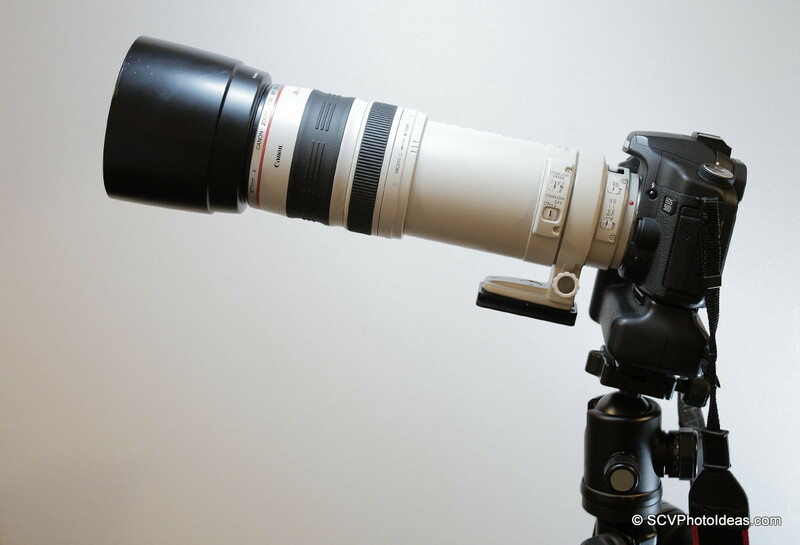 The EF 100-400 L IS USM f4.5-5.6 lens, was chosen for its variable behaviour, as it extends significantly from 100mm to 400mm. By extending, a big part of its optical elements move further away, therefore so does its center of gravity. Although a little lighter in weigh than the other lens in this test needs a more powerful ball head that would withstand more torque. This fact shows very clearly that mass (weight) by itself is not so critical, as torque is, as a comparative unit of measure. In simple words, it does not matter how heavy a lens is, but how far from the pivoting point of a ball head this weigh will hang. 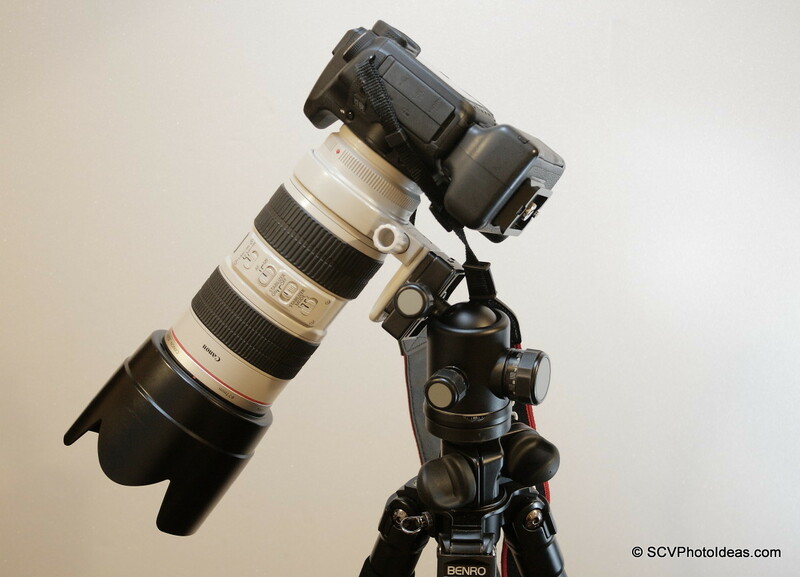 A combination of a Canon 50D w/ battery Grip + EF 100-400 L IS USM extended at 400mm and clamped at the base of the battery Grip. This is the higher and longer setup to give the ball head a hard time. In order to reach a sweet spot on the B-2 ball head a Friction at No 7 should be set. The head locks solid at turning the Lock knob at No 5. Now measuring at 45 degrees, in order to reach a sweet spot on the B-2 ball head a Friction at No 7 should be set. But the head locks solid at turning the Lock knob at No 7 too. Same setup but the camera lens combination is clamped at the lens foot. This of course, is a more balanced and recommended setup. In this case the ball head reaches a sweet spot by setting the Friction knob at No 6 and the ball locks by setting the Lock knob at No 3. 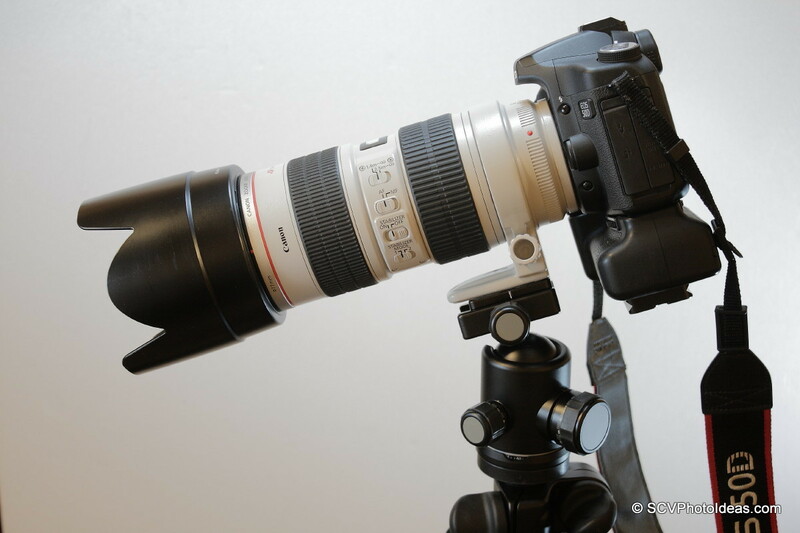 EF 100-400mm L IS USM retracted to 100mm. 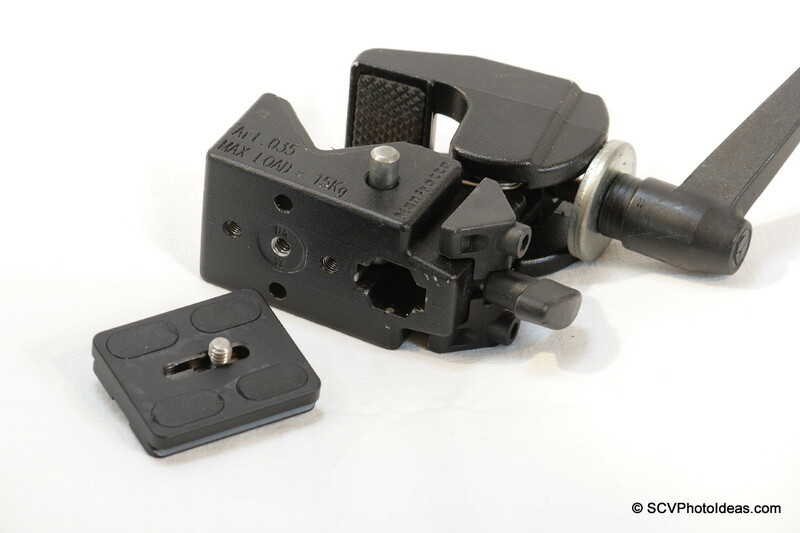 Here Friction set at No 6 for a sweet spot and Lock knob at No 3 for full lock. 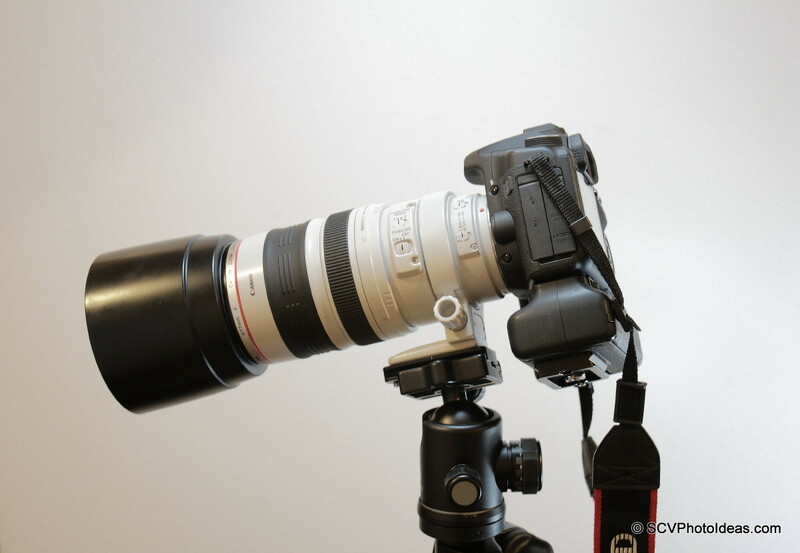 The EF 70-200mm f2.8 L IS USM lens was chosen as an example due to its popularity among canon users. 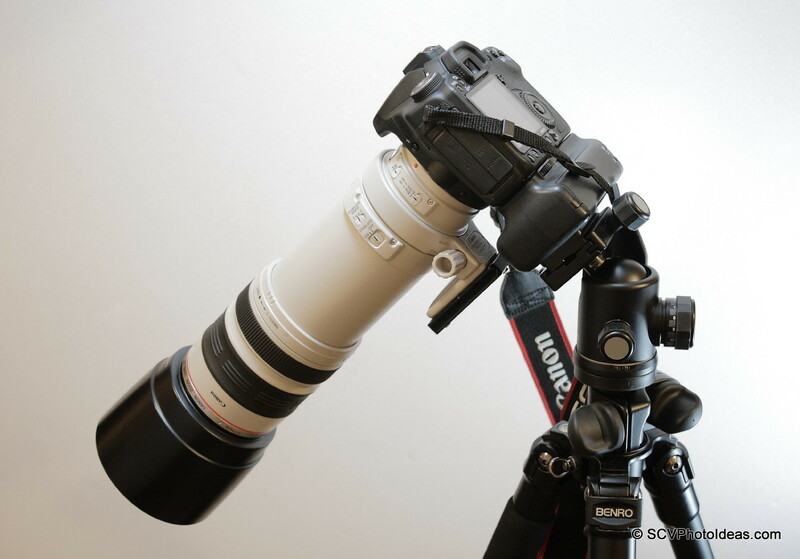 Its mass is a little higher than the 100-400 lens but when the 100-400 lens is retracted to 100mm they are almost identical in length and thus behaviour. On the other hand, there is also a difference in the settings for Friction and Lock between 70 and 200mm. 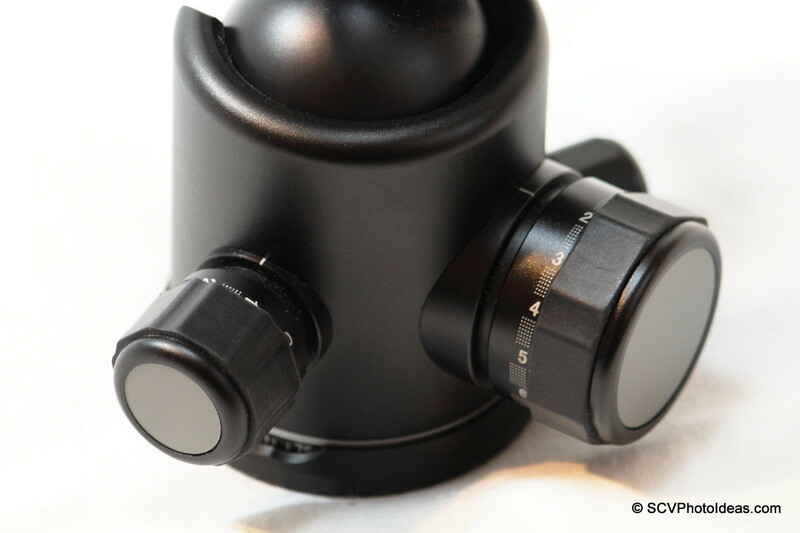 Although the 70-200 lens does not extend, when setting the zoom to 200mm a major part of the optical elements move forward internally, repositioning the center of gravity thus increasing the torque. EF 70-200mm f2.8 L IS USM at horizontal positioning. Friction knob set at No 6 and Lock knob set at No 3 when at 70mm. Friction knob set at No 6 and Lock knob set at No 4 when at 200mm. EF 70-200mm f2.8 L IS USM at 45 degrees positioning. Friction knob set at No 6 and Lock knob set at No 4 when at 70mm. Friction knob set at No 6 and Lock knob set at No 5 when at 200mm. The measurements for this ball head were for me more than expected. The design and implementation quality has improved vastly in the last couple of years. 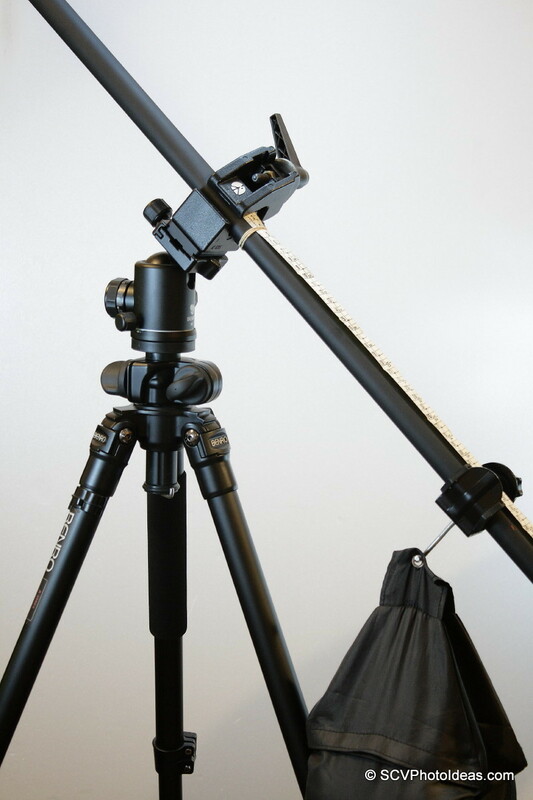 As shown above it can easily handle medium to long telephoto lenses only by half the scale of its locking knob mechanism. 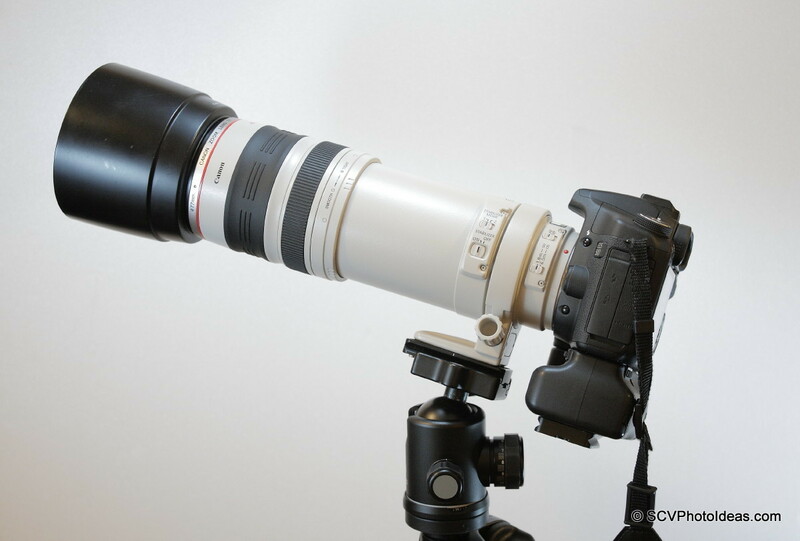 Lenses up to 400mm f4.0 would not create any problem. According to measurements, even bigger and heavier lenses can be handled if the circumstances bring it. 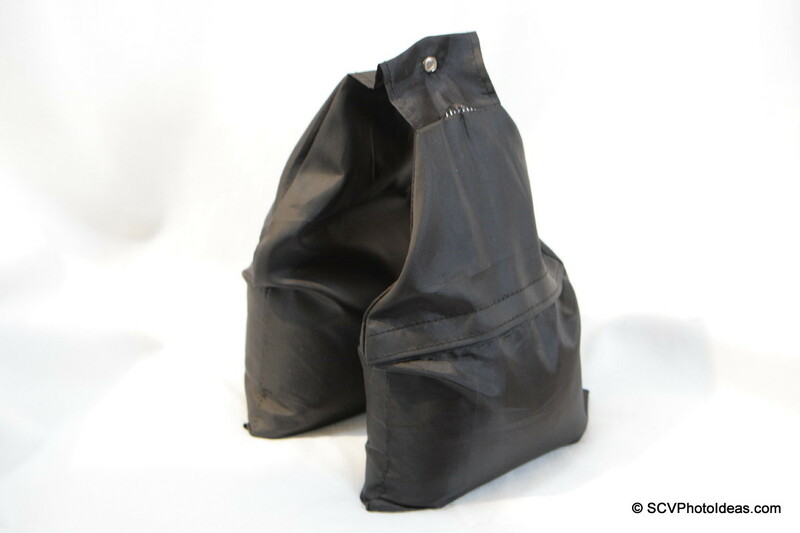 But for bigger lenses, there are more convenient solutions. There are a few drawbacks in performance. The needed compensation in friction when tilting or the slight lock when overtightened. Considering all the above, I would never claim this ball head as perfect. However, we have to judge products according to their target group and in this aspect this ball had performs well above average in general terms and sometimes far better than equally priced products. BUT mentioning its price I would claim this ball head a great value for money. This test was run on one product sample, using the above described method. Although the readings are good and overcame the expectations for the product, it can not be used as a rule, unless more samples of the same product are tested. Furthermore, similar comparison tests should be run with comparative capabilities products so as to reach a solid conclusion. 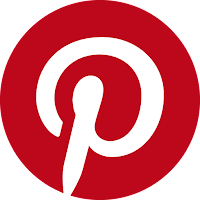 I hope you found this article useful, thank you for viewing. 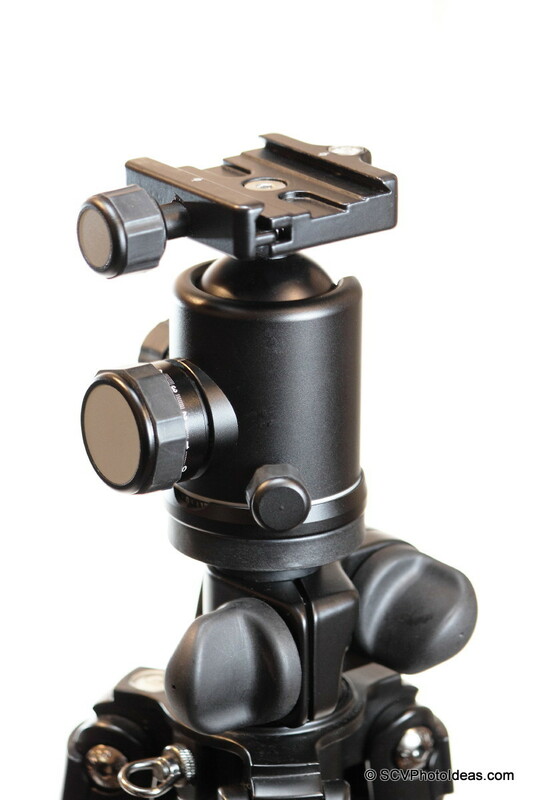 The Benro B-2 Ball Head is available from Amazon, as well as from eBay. Useful information - thanks, mate! Thank for comment, you'r welcome! Thank you for the comment and the correction. You are absolutely right about the calculation of Newtons. I have mistakenly labeled the torque measurements as N*m since the numbers represent Kilogram-force metre (Kgf*m). Due to the fact that 1-2 ball head manufacturers mention Torque in their specifications expressed in Kgf*m, I prefer to keep the numbers as such for easier comparison and revise the units.